I have written in diaries for about five years now, so since I was about 13, pictured above is the notebooks I have filled up in that time. Although I’m pretty sure my toes would curl in embarrassment if I read some extracts from the mind of my thirteen year old self everything I wrote was important to me in the moment that I wrote it, and I respect that. Young teenaged girls get enough stick in the media and I’m not about to add to it, instead I am fully in praise of my 13 year old self for starting me on a life-long habit of writing. Diary writing took me through my rather emotionally rocky teen years, I still use writing as an emotional outlet today. If I’m stressed out or unhappy, I turn a new page and write about it. Writing a diary also allows me to keep track of hundreds of events in my life, whether they be massive events like going to university or relatively small events like going for a meal with some friends, every one of them is recorded in my diaries. Diary writing is not all writing about emotions, never once have I actually asked my diary for advice or even written the words “dear diary”, most of the time I write about what I’ve done that day, who I was with and what made me happy. Diaries allow me to bottle my happiness to read about on rainy days. Wordsworth once said that poetry was “the spontaneous overflow of powerful feelings: it takes its origins from emotion recollected in tranquility.” Although I’ll sometimes turn to a diary if I’m in need of a good rant about something, most of the time it is about recollecting the days thoughts. I think that diary writing is the purest, most powerful, personal and perfect poetry. I write in a diary not to sell it, or publish it but to simply record the poetry that is my one small life. There’s a tip that comes up over and over again in articles about creative writing – you should always write everyday. Although what I write in my diary isn’t fictional I think that in writing almost everyday it has helped me in my creative writing. I once read that Virginia Woolf dedicated an hour of every evening to writing in her diary and I think this is reflected in the style of her writing, I don’t even come close to that but I often rework the reality that I write about into my creative projects. Jack Kerouac, before writing ‘On the Road’ in a drug and drink fueled three week spurt spent months travelling and writing, perfecting his style of ‘spontaneous prose’. Countless other brilliant writings throughout history have keep diaries: everyday diaries, political diaries, war diaries, diaries of voyages and life at sea. Diaries exist as a perfect oasis in the modern world, they allow me a moment of silence and reflection in a world of noise and movement. I’ve never really gone in for relaxing baths or meditation so diary writing is my own perfect form of self-care, helping me clear my head before bed. There’s never a wrong time to start writing a diary even if it’s just a sentence a day, or a few bullet points, I thoroughly recommend grabbing a note book and finding your own personal voice. A notebook – I personally go for ruled pages and a notebook design that has some sort of ribbon or magnet to keep it shut. I’m far from being a technophobe but I insist that diaries cannot be written on the computer or phone, it is something about scratching the paper with a pen that makes the process so cathartic. I like to personalise my notebooks with stickers, usually from Paperchase or Etsy.com. 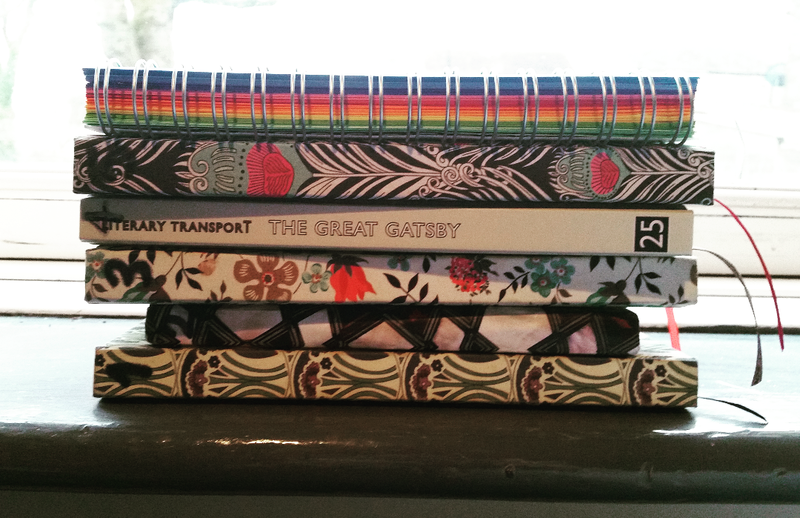 I have a stack of empty journals on my shelf for when i need to start a new one. A writing implement – ball point pen, pencil, felt tip, colouring pencil, fountain pen etc. Anything at all that’s close to hand, you don’t need to colour code your diary or use the same pen everyday unless you want to. The experience of keeping a diary is personal, that is the most important part. I personally go for whatever pen is closest but I like a fountain pen. Time – 2 minutes a day, 10 min every other day, an hour on a Sunday morning, an hour every evening if you’re Virginia Woolf. It doesn’t matter when, where or how often you write as long as you get into the habit of writing as often as you can. Yourself – when writing a diary you don’t have to impress anyone, you only have to write for yourself and to make yourself happy. It’s as simple as that, writing a diary is about making yourself happy. There’s no rules to what you write. If you feel like writing poetry and sonnets about the people in your life – go for it. If you struggle with spelling and grammar, that’s no issue when it comes to diary writing, no one is going to judge you as long as you’re happy with what you’ve written.